I love the look of this modern doily! And the lovely petite sentiments fit just inside of the doily:) To really get the most of the delicate design, I stamped the doily with Versamark watermark/embossing ink and then dusted it with Ranger Perfect Pearls. If you're not familiar with them, Perfect Pearls are pigment powders that you apply with a soft paintbrush. 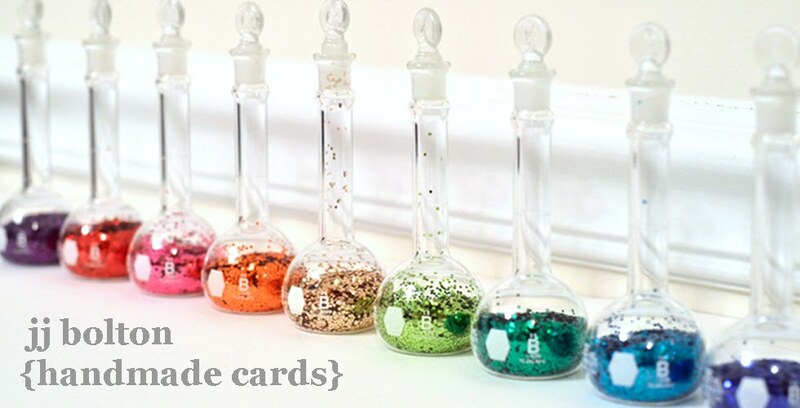 Pigment powders have been around awhile, but I've seen them around lately and I thought this would be the perfect project. As you can see it gives a lovely glowy look! I love the look of rich gold on purple. For a little more bling, I used my gold Stickles to add glittery dots to the edges of the doily. This gives it a little detail and a bit of texture. 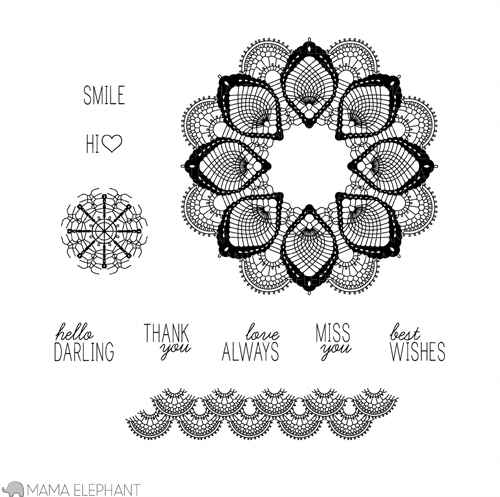 Thank you so much for stopping by all week to check out my projects and all the fun new stamps! I hope that you get a chance to drop by the rest of the DT to see what fun they had with this beautiful set! absolutely stunning details in gold!!! OMG! JJ this is incredible! Wow! Wow....this is gorgeous! Love the vibrant color! Looks so rich. Love the purple and gold. This is stunning JJ! I love the gold and now feel like I need some pigment powders. Wow! Way to emboss the image with PP!! Love this rich and vibrant look! So beautiful, JJ!! This is utterly gorgeous, no idea you could emboss with PP--need to try that! Very reminiscent of Indian art in these colors with the gold dots. This would make the perfect card to give to someone for Diwali or a wedding! Gorgeous! How did you use the powders and not get it everywhere? I find it flies and leaves a sheen. Tips please! I love the richness of the purple and gold. Gorgeous stamps too. This is gorgeous - you could link up to CASology - this week's Cue Card is Royal! Wow...the color combination is just stunning! Beautiful design. oh my! Gorgeous! Loving the gold on purple! Absolutely gorgeous card, JJ! 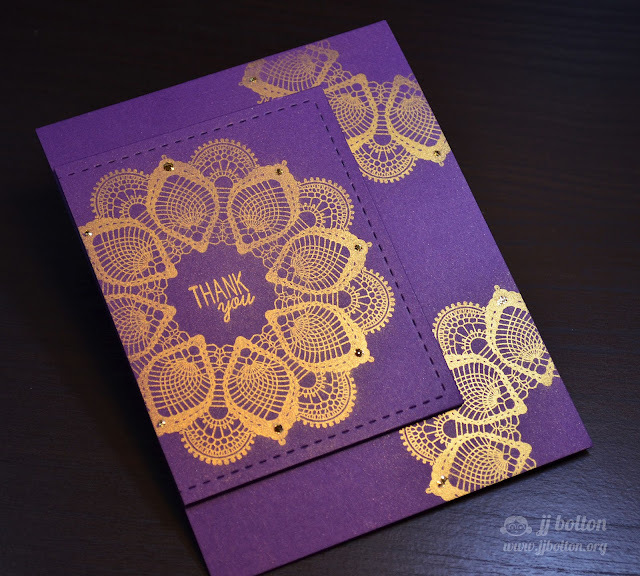 I love the gold embossing with the rich purple background...stunning design, too! I had already decided that this stamp set was my favourite of this new release and your stunning card only strengthens my determination to add this stamp set to my collection sooner rather than later (if my piggie bank allows it). I love the rich and detailed gold on purple! Beautiful! Gold on purple is delicious! Gold on purple? GOR-juss!! Love this. Perfect combination. I immediately thought of this technique (was a MIM not too long ago) when I saw the fantastic detail on this stamp. Just love it. Great job with the pigment powders (mine never stay set!) and of course they are perfect for your elegant design - so rich and royal looking - the gold on purple! I'd love to hear from you! Aloha! To get on the mailing list for random prizes and cards, click here to add your info the my Postable Address Book! Please feel free to use my creations as inspiration. You are encouraged to CASE, lift, or borrow ideas for personal use, but please do not copy for business purposes or for publication submissions. Ribbon Girls is the creator and sole owner of all templates and Silhouette files provided on this site. These files are provided for personal use only. Do not copy, distribute, or use the file itself for profit or business purposes. Items cut using the files provided on this site may be used for sale as long as you credit this website. If you use my cutting files, please credit and link back to this website. Occasionally I receive free product from a company or magazine in exchange for participation in an online event or for publication. Sometimes I even get free product with no strings attached. In all situations, I am NOT paid for my opinion or endorsement. My opinions and any endorsements are strictly my own and are given willingly! In the past, I participated in affiliate programs, but have since discontinued. None of the links on my site are used to generate affiliate pay nor do I get paid for click overs. Likewise for advertisements. This is an ad-free zone. Copyright © 2003 - 2014 Ribbon Girls. Simple theme. Powered by Blogger.